Ted James with a gift from the ocean, a 41.75-pound snook, circa 1967. Photo by Ralph Boynton. The gift of peak experiences happens to all of us. Sometimes we set them up, and sometimes they’re gifts from heaven. We all do our best to orchestrate memorable experiences. For me, a common denominator has been the ocean. Diving, surfing, sailing and fishing are all included. During the 18 years I handled sales and marketing at Costa Del Mar Sunglasses, I was fortunate to witness blue marlin tournaments in St. Thomas, the first Redbone tournament in Islamorada and good times at the Sailfish Marina with the West Palm Beach Fishing Club. Another thread has been the fishing/surfing connection. Having an affinity for the ocean is common to people who fish, and for surfers. Ben Hartig, longtime member of the South Atlantic Fishery Management Council, was one of the most revered surfers at Reef Road in Palm Beach. Nobody dropped in on Ben Hartig. Bill Holmes, who manufactured legendary “Holmesy Surfboards” in Juno Beach, also had the woodworking talents to do custom interiors for Rybovich Boat Company for many years. The late Ted James started Fox Surfboards in Palm Beach County in 1968 while he was catching monster tarpon and snook in the area, and later fished the Outer Banks of North Carolina while manufacturing Fox Surfboards and Sailboards there. Mark Castlow of Fort Pierce started Atlantis Surfboards in the 1960s, and then moved into manufacturing world class Maverick flats boats and Dragonfly Boatworks today. 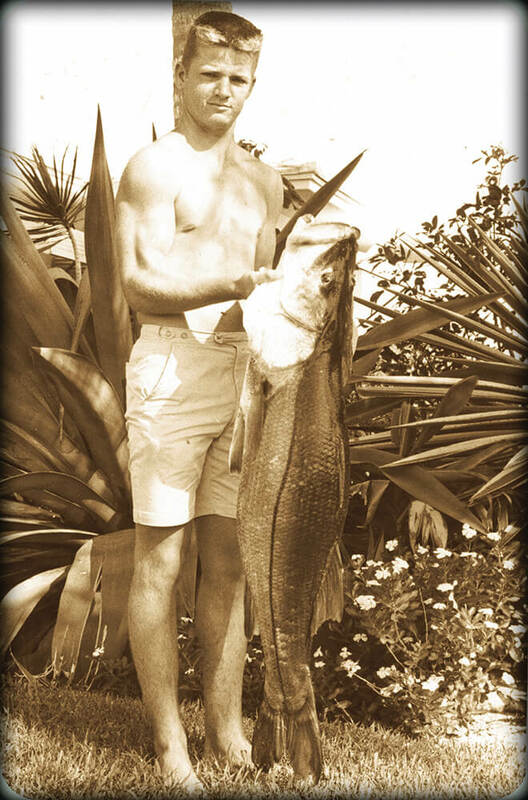 Ralph Boynton, long time Lake Worth pier surfer, won the West Palm Beach Fishing Club’s annual Nora Award for the heaviest snook three times, and holds the 50-year record at 42.08 lbs. Kristy Murphy grew up fishing and diving in the Bahamas before moving to Jupiter. She was so good in the water she could free dive 30 feet, spear a grouper and grab a lobster with the same breath. Kristy went on to win the Women’s World Longboard Championships in big waves. One of the world’s best big-wave surfers, Mark Healy, often free dives 100 feet deep as a volunteer to tag sharks for conservation. The historic Sea Mist drift fishing boat out of Boynton Inlet has had two of the best local surfers as long time captains: Burt Garnsey and Charlie Brown. And don’t forget our own Florida fishing guides/writers Capt. Mike Holliday and Capt. Rodney Smith, both also hooked on surfing. Holmesy Surfboards, Fox Surfboards and Kristy Murphy are all featured in the grand opening of the new Surfing Museum in the Lake Park Arts District on Dec. 9. The Surfing History Museum recently moved from Delray Beach to Lake Park at 738 Park Avenue and the grand opening includes the premier of the new surfing film “Dream Steeple.” The museum showcases the 100-year history of surfing in Florida. We hope to see you there, and “talk story” about peak experiences and gifts from the ocean. Tom Warnke is a Trustee and Historian for the Palm Beach County Surfing History Project. Email Tom at [email protected] or click on surfhistoryproject.org for additional info.